Royal Wheels India is an adventure travel group organising South India Tours Package. Chennai is the centre of the Hindu tradition of Bharata Natyam (classical dancing) the art of temple sculpture also comes from this part of the country, and gives expression to both the devoutness and the artistic skills of the Tamil people. 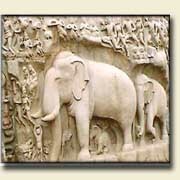 Chennai is the home of the ancient Dravidian civilisation, one of the oldest articulate cultures in the world. It is a city where the landscape of the past lives easily with more recent history. This busy, efficient metropolis is a good centre to plan a journey over South India. Make use of the international and domestic airport and the massive network of trains and buses. The friendliness, sincerity and colourfulness of the people can slowly be absorbed while taking a stroll over the sandy stretch of beach known as the Marina, or visiting Fort St. George, built by the British East India Company. So many of the street names reflect the city's long association with other cultures; China Bazar Road, Armenian Street, Portuguese Church Street for instance. In 78 AD, the Apostle St Thomas was martyred in the city, but the Christian faith now finds graceful expression in the many churches, particularly the San Thome Cathedral. View the whole panorama from the Chennai lighthouse, or experience the culture from ground level in the temples, art galleries or museums. Head off in any direction from Chennai - even east, across the Bay of Bengal by boat or plane to Port Blair in the Andaman Islands; a paradise archipelago, lush and forested, home of some of the most exotic plant-life in the world. The crystal clear waters shimmer with tropical fish, and the islands are famous for their corals and water-sports facilities. 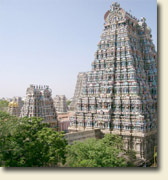 North of Chennai is the large state of Andhra Pradesh, rich in archeological and architectural treasures. The capital, Hyderabad, was once the seat of the fabled Nizams. The Charminar is a national symbol, and the Salar Jung Museum a rich repository of the Raj. The devout Dravidian people of the south live and breathe their ancient religion. Nothing, however, can really prepare a visitor for the temples, where images of the quiet bustle of the vast halls, the huge gopurams completely covered by coloured sculptures of gods and goddesses, the sight of bare feet walking across cool slabs, the heady smell of incense and the chime of the temple bell rung by priests and the faithful leave entrancing impressions. Rustic carts drawn by oxen with their brightly coloured painted horns, smiling villagers harvesting the hay at the side of the road - these will be some of the memorable features of the short journey from Chennai to the famous temple town of Mahabalipuram. A swim off the glorious beach will refresh you after absorbing the wonders of the romantic shore temples and of Arjuna's Penance, the huge rock carvings of animals and gods, There are so many impressive temple towns in South India - nearby Kanchipuram with its spectacular gopurams, ' visible from miles away, or other magical sounding places - Chidambaram, Tanjore, Tiruchirapalli, and, most of all, the pilgrim centre of Madurai - one of the oldest cities in Southern India - with its dramatic and lively Meenakshi temple, dedicated to the fish-eyed goddess. Alternatively, for a different style of relaxation, visit the attractive French-style coastal town of Pondicherry, south of Chennai. In the neighbouring state of Karnataka lie the stone-carved temples of Belur and Halebid. Relive the exciting era of the Hoysalas, who flourished around the 12th century, by examining the endless stories which the sculptural detail portrays the war, the hunt, the animals, the dancing girls and, of course the gods. Situated on top of a hill in Sravanabelagola is the massive statue of Lord Bahubali, dwarfing the landscape. Lose yourself in the strange and beautiful ruins at Hampi. Visit Bangalore, the state capital, for another, different taste of Indian urban life; the city is affluent, bustling and vibrant and -splendidly adorned with trees, parks and gardens. It is also the most important centre of India's 'nonsmoke' industries, including aerospace, machine-tools and electronics. Further delights are waiting in the gracious sandalwood city of Mysore, where it is possible to stay in the one-time home of an ex-Maharajah, now the Lalitha Mahal Hotel of gleaming white beauty. Incense is manufactured in the city, and the sweet and fragrant smells of jasmine and rose and musk will linger in the air and in the memory. Kerala - land of surf, spice and magic, an ancient crossroads of cultures...Chinese fishing nets drawn up on the golden sand, Jewish synagogues, Portuguese forts, Dutch and Syrian churches, and of course beautiful Indian temples and palaces...backed by mountains, fringed with surf, rich in spice plantations and coconut palms, relaxed and tranquil under the warm tropical sun. Laze gloriously on the unspoiled and beautiful coconut beaches of Kovalam, India's finest beach resort; or visit Cochin, with its beautiful waterfront, or Trivandrum, with the Padmanabhaswamy Temple, the former rulers' place of workshop; both towns are also memorable for their churches and museums. While in the area, move into the hinterland and hear the trumpeting of an elephant and the chatter of monkeys running wild in the green and watery Periyar Game Sanctuary. Inhale the pure fresh air from the height of the Nilgiri hills while absorbing the spectacular views in Ootacamund or Kodaikanal, perhaps followed by a gentle trip on the backwaters between Aleppey and Quilon, watching the villagers at work in the lush green paddy fields. A visit to the south may well coincide with one of the many magnificent festivals; if not, don't worry, as there will usually be a celebration of some sort in every lively village here. The Bharata Natyam dance originated in the south; the rhythm of the music, the colours of the costumes and the grace of every stylised movement will spellbind the onlooker. Experience the beauty and elegance of the Kathakali mask dance, which depicts tales of the gods, heroes, demons and fabulous beasts of Indian legend, or the grace of Kalaipattu, the martial art of Kerala. Join the happy and smiling throng of revellers as fireworks explode into the night sky, brightly coloured flowers are scattered in the air, gloriously bedecked elephants and cows join the procession in the street, everyone dancing to the beat of the tabla sights and sounds all entwined with the haunting rhythm of ancient Sanskrit Mantras (chanting). Kanya Kumari (Cape Comorin) in Tamil Nadu, India's Lands End, washed by three seas, where at the time of the full moon it is possible to watch the sun set and the moon rise at the same time, a popular pilgrimage town, the end of the railway line ... from here to Jammu and Kashmir is over 3,300 kilometers, and the railway journey will take three days, passing through the whole staggering diversity of India - the great plains, towering mountains and rich forests, the serene temple towns and lively resorts, thriving cities, tranquil hill stations and tiny villages, the people, the history, the wildlife, the cultures... such a wealth of beauty and mystery and laughter in this graceful and gentle land. An experience both indescribable and unforgettable as only India can be. She is waiting for you, and has been for 5,000 years. All you have to do is arrive; the wonder of India - only nine hours away.